Additional structural information came unexpectedly from a small piece of chert (0.2kg) found in 1998, whose true nature was recognized only after the paper  became available (**). In addition to Ventarura cross-sections as the one in Fig.1 it shows pairs of such. One type of sections (Fig. 2) seems to represent the 30° forking reported in , which may occur near the fertile region. Another type, also pictured in Fig.4, may occur below or on sterile shoots. The branching seems to be fairly symmetrical here but there is other evidence  that this is not always so. 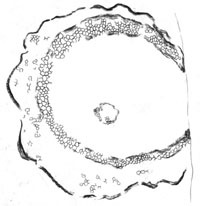 Fig.2: Cross-section of forking axis of Ventarura. 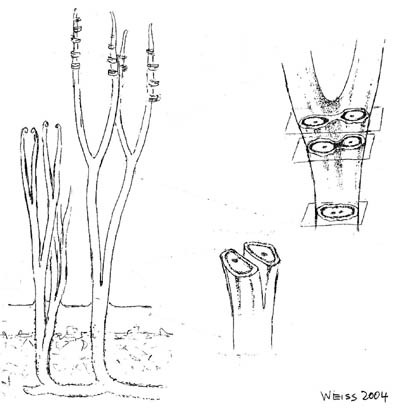 The dark tube inside has become two separate tubes but the faintly seen outline indicates that there is a connection between them (see Fig.4). Note also the horizontal agate bands revealing that the plant was not upright but lying low during silicification. Width of the picture 13mm. Another thin slab cut from the small specimen in 2004 reveals a tiny incurved tip, probably the top of a not fully grown-up shoot (Fig. 3). This sparse additional fossil material discovered lately has led to a tentative reconstruction (Fig.4). Specimens found lately as well as those described in  indicate more profuse and unequal branching below. Also there is evidence for new shoots developing inside older ones, similar as observed with Trichopherophyton. * The chert where Ventarura was discovered differs in location and stratigraphy from the previously known stack of Rhynie chert layers and therefore has been named Windyfield chert . ** This chert sample was found well away from the Windyfield site so that it is either displaced Windyfield chert or else can serve as first evidence for the presence of Ventarura in other Rhynie chert layers. Presented at the 3rd Chert Meeting, Chemnitz, 2004. *** According to  and a few new finds, the rhizome is more profusely branched. 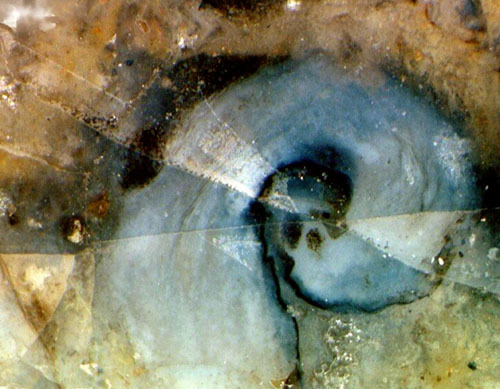 **** Evidence contradicting the idea of a reinforcing tube inside Ventarura has been accumulated since. See Rhynie Chert News 60, 66, 82 . 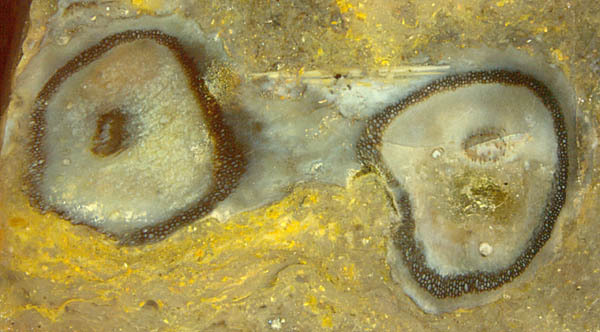 Sample: 0.2kg, found by Sieglinde Weiss in 1998. The rolled-up tip in Fig.3 has remained the only one ever found up to now (2016).